RETRO KIMMER'S BLOG: MANFRED MANN SINGER CHRIS THOMPSON HAS A NEW RELEASE! MANFRED MANN SINGER CHRIS THOMPSON HAS A NEW RELEASE! London, UK - Esoteric Recordings is pleased to announce the release of 'Jukebox: The Ultimate Collection', a two disc anthology by legendary CHRIS THOMPSON! Known for his work as the lead vocalist and guitarist on many hits with Manfred Mann's Earth Band, including “Blinded By The Light”, “For You” and “The Mighty Quinn” as well as featured on the classic Jeff Wayne concept album 'War of the Worlds', Chris is also a noted songwriter (penning among other songs the smash hit “You're the Voice” for John Farnham). His most recent studio album, 'Toys and Dishes', his first in over ten years, (released on Esoteric Antenna), gained excellent reviews from critics and praise from fans worldwide. Chris Thompson continues to draw enthusiastic live crowds throughout Europe. 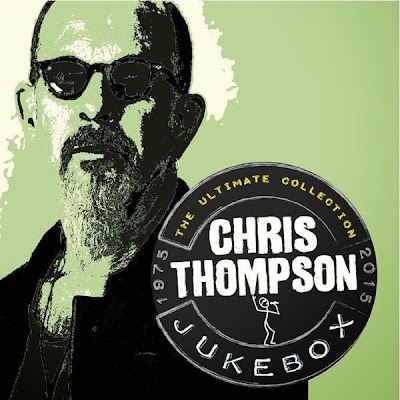 'Jukebox: The Ultimate Collection' is a fine, brand new 36-track newly remastered compilation of material that has defined Chris Thompson's career, including songs such as “Blinded by the Light”, “For You”, “Father of Day’, ‘Davy's on the Road Again”, “Martha's Madman”, “The Mighty Quinn”, “Thunderchild” and “You’re the Voice’, along with tracks from 'Toys and Dishes' such as “Eddie Wants to Rock” and “Millie Christine”.